Year of the Fish caught my eye. I had seen them on Facebook and seen a few comments, but I just couldn’t remember what it was I should order. Don’t worry the owner walked us through it. We wanted to try the Fish and Chips and he said they were good. That was good enough for me. I will admit that I’m not a huge fan of fried food, but it’s mostly because some fried food is so heavy you can’t even stand it after you eat it. Others when done correctly can make a good thing great. 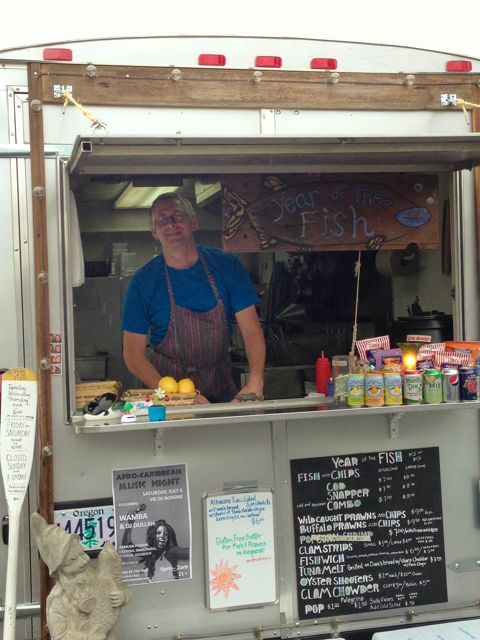 Great little fish and chips food cart. My only regret is that after we were done and leaving I stopped to talk to the owner again and he told me how great their clam chowder was. Dang it!! How had we not seen that?!! Well I guess a trip back will be in order. 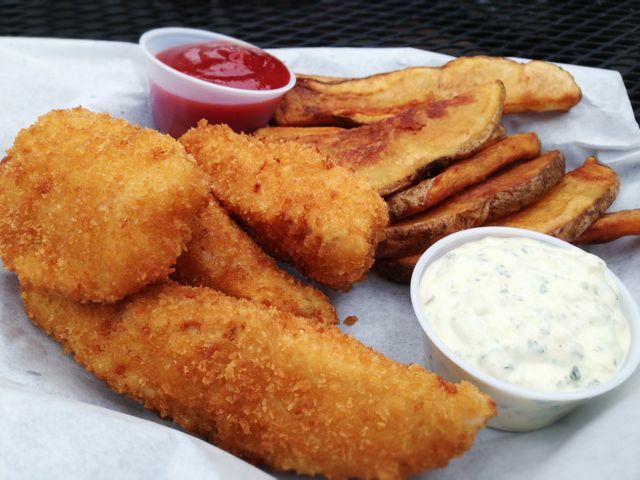 We hand make everything right here in the trailer; Clam Chowder (New England), Cole Slaw, Tartar Sauce, Cocktail Sauce, Tempura, Salmon Fritters, Dipping Sauce for the Fritters, and rough cut Plank Style Chips. I do my business with local purveyors. I source my seafood locally as much as possible when possible. I recycle everything I can. I use canola oil in the deep fryers, olive oil in the saute, and sea salt is the only salt. That right there is why I love locally owned restaurants and have a great deal of respect for those doing it all in a food cart. Atmosphere at this pod is quite open. There is plenty of covered seating. Pricing is pretty average and the quality was top notch. Year of the Fish is located on Division and 50th. Awesome! I haven’t heard of this cart. Sounds good, I love fish n’ chips.